Connie Prince Digital Scrapbooking News: Marvelous Monday Game Winners, sales and a Freebie! Marvelous Monday Game Winners, sales and a Freebie! I hope the weather is far better for you than it is here in Central Florida! It's been raining for over a week and it looks like it won't be stopping any time soon! But it is perfect scrapbooking weather! Lets start by congratulating Angela and Laurie S! You ladies won our weekly blog game! Angela, you won two weeks ago and Connie was out of town so she is sending you your coupon now and Laurie S is this week's winner! Come back on Wednesday for another chance at winning! Don't miss out on grabbing some awesome kits before they are gone for good! Tomorrow is the last day to apply to be on Connie's Guest CT! 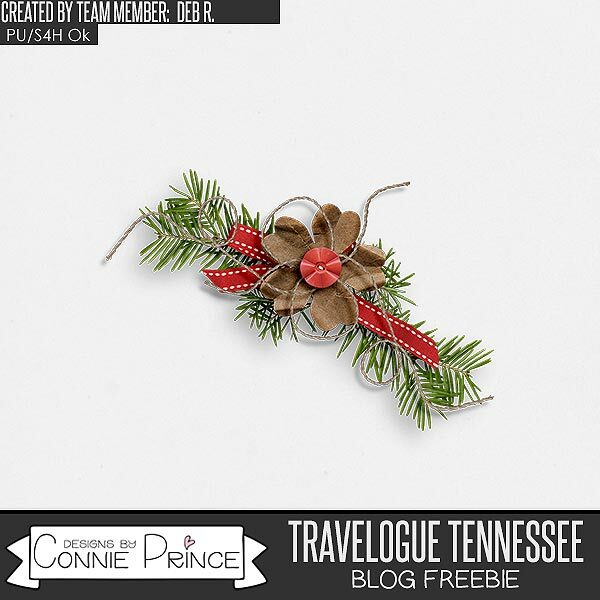 Deb R, made you this cluster using Travelogue Tennessee!